The $150,000 FEI Nations Cup didn’t play out at all the way the American or Canadian teams would have wanted. Both are usually top contenders in any team competition, and on Saturday night both teams were populated with some powerhouse pairs: Beezie Madden led the U.S. effort, and “Captain Canada” Ian Millar anchored the Canadians. But rails plagued both teams while clear rounds came time and again for Great Britain, Ireland and Mexico’s riders. Nine teams competed, and the top six came back for the second round. Finishing on a score of 8, the U.S. team clocked in at seventh and didn’t make the cutoff. Canada posted 9 faults to finish eighth. This opened the door for British riders, who’ve been looking to turn their own luck around in team competitions. Great Britain employed a similar strategy to what U.S. chef d’equipe Robert Ridland has been doing with his Nations Cup teams—building their team with a mix of young and veteran pairs. It paid off—the Brits finished Round 1 in the lead on a score of 0 and held on for the win with another zero-score effort in Round 2. Ben Maher and Tic Tac anchored the team and were joined by Emily Moffitt and Hilfiger Van De Olmenhoeve, Emily Mason and Explosion W and Amanda Derbyshire on Luibanta BH. 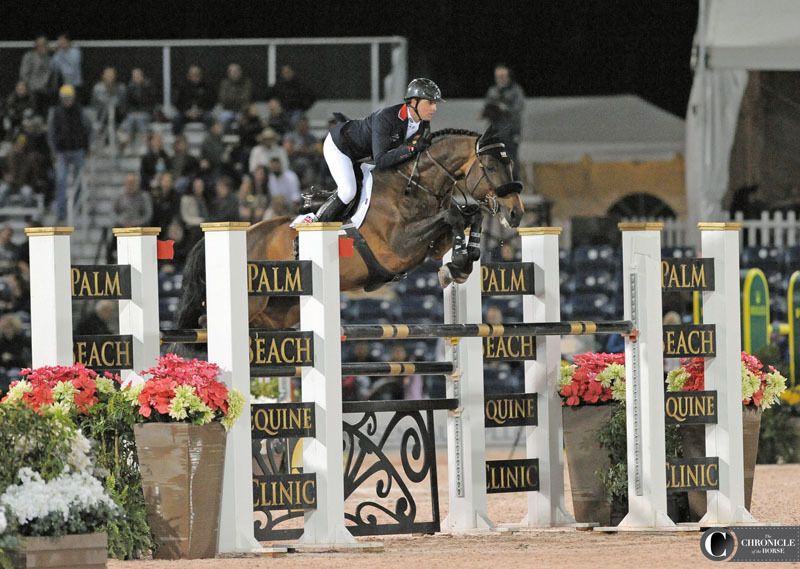 Ben Maher and Tic Tac posted two clear rounds to lead the British team to victory. Photo by Ann Glavan. What specifically did Maher want to see change? He was pretty frank about it. 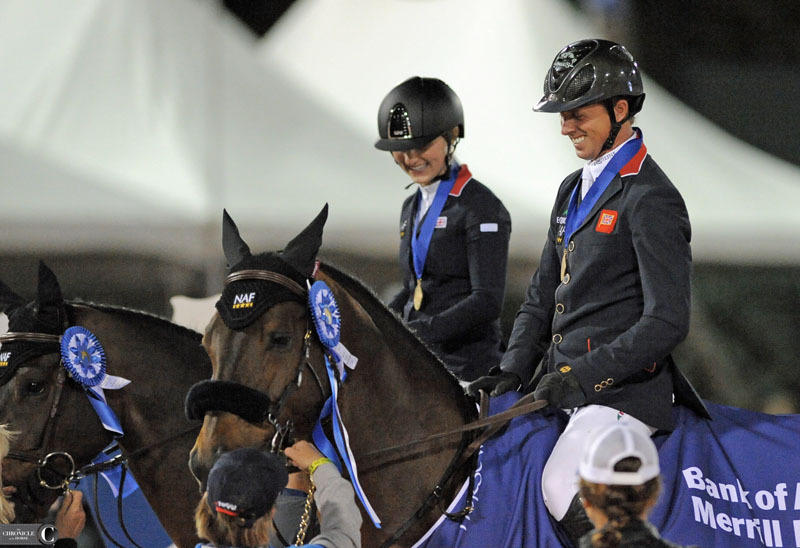 Ben Maher (right) has a laugh with teammate and student Emily Moffitt as they ride in for the award ceremony. Photo by Ann Glavan. The championship Maher is referring to is the FEI World Equestrian Games held in September of this year in Tryon, North Carolina. Most notably, the individual gold medalist from the 2016 Rio De Janeiro Olympic Games Nick Skelton has retired from top competition, as has his mount Big Star. Great Britain’s chef d’equipe Di Lampard wanted her riders to come out strong early in 2018, and she couldn’t have asked for much more of her team Saturday night. With the lead in Round 1 they jumped last in the rotation for Round 2, and when Derbyshire had a rail and a foot in the water, Britain’s chance at the top podium spot hinged on Maher’s second clean round. 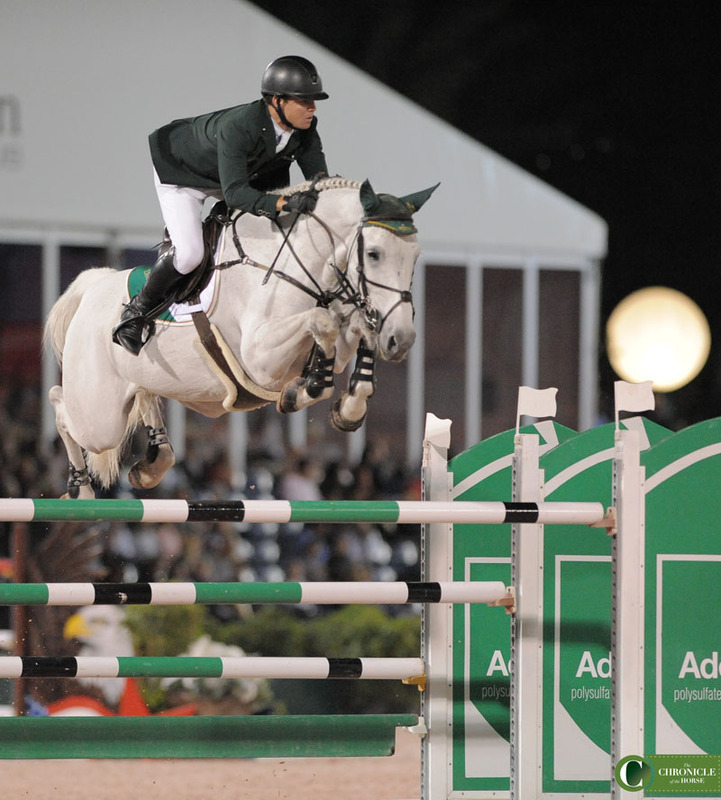 Maher cemented the team’s win; Ireland took second on a score of 5, and Mexico took the third spot on 10 faults. 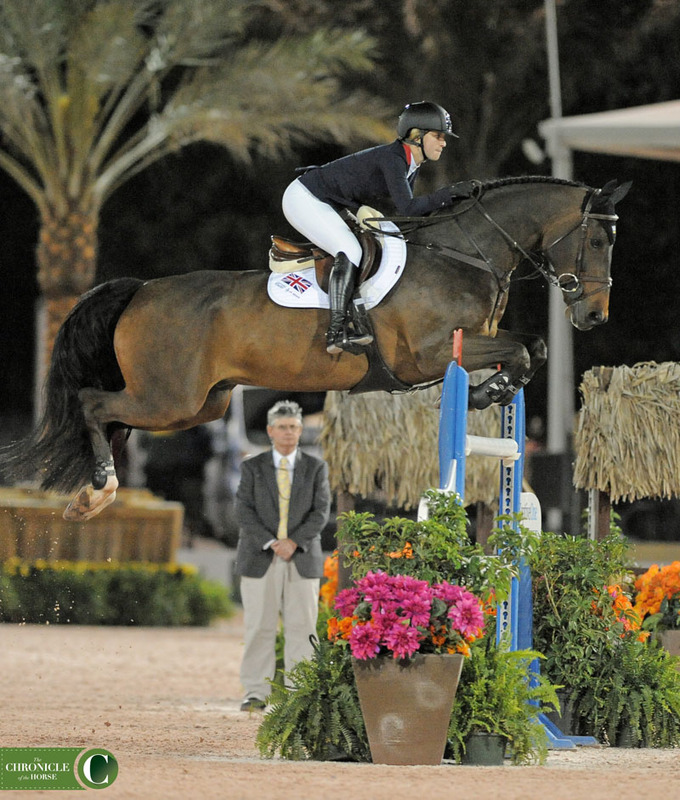 Emily Moffitt and Hilfiger Van De Olmenhoeve jumped clear in round two for Great Britain. Photo by Ann Glavan. U.S. chef d’equipe Robert Ridland was as surprised as anyone that the American effort of Lillie Keenan on Fibonacci 17, Adrienne Sternlicht on Cristalline, Catherine Tyree on Bokai and Madden on Breitling LS didn’t even get to jump a second time. Beezie Madden and Breitling LS posted a clear round for the U.S. in Round 1. Photo by Ann Glavan. The U.S. team was intentionally comprised of young horse and rider pairs in part to give them experience for future events—the Wellington Nations Cup is a standalone event, not a part of the series that qualifies countries for the Longines FEI Nations Cup Final in Barcelona, Spain. “One of the reasons Lillie Keenan was on the team with Fibonacci was to really give her a chance to get to know that horse,” Ridland said. “You have to do a lot of that in the ring, in the field of play. I guess one of the shocks is not even being in the second round because we had a totally different game plan that we were going to do for the second round. It would have been nice to see how that worked out for Lillie. 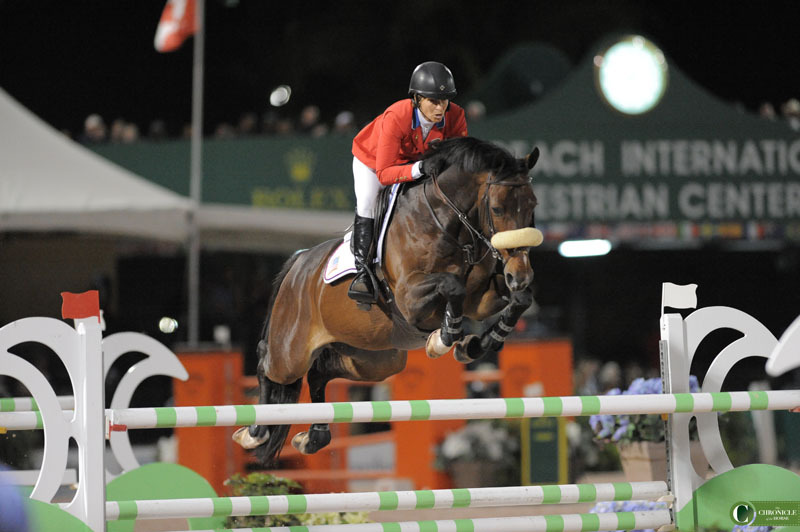 Shane Sweetnam and Indra Van De Oude Heihoef helped Ireland to second. Photo by Ann Glavan. 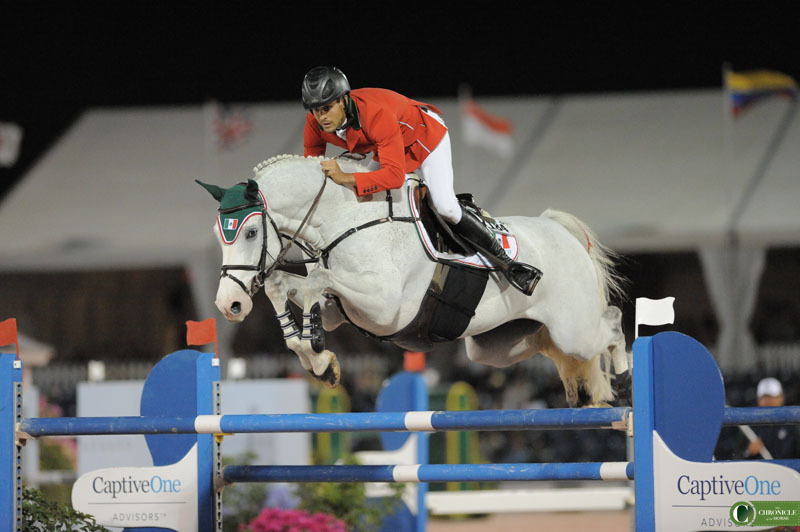 Eugenio Garza Perez and Armani SL Z helped get Mexico onto the podium in third place. Photo by Ann Glavan.